We often say the police can’t police themselves. Yet, in states like California, police not only investigate their own wrongdoing - they also heavily influence the laws that govern their behavior in the first place. For the first time, this analysis reveals how police unions and associations influence legislation governing police behavior in the Democratic supermajority state – a state where more people are killed by police than anywhere else. Spending significant resources to lobby legislators and convince them to oppose police reform. California’s state legislators have benefited substantially from the financial backing of police unions and associations. Campaign Finance data from the California Secretary of State’s Office shows that Governor Jerry Brown and 118 of California’s 120 current state legislators received campaign donations directly from police unions and associations since 2011. In total, police unions and associations gave $5.5 million to candidates for the California state legislature since 2011. For context, that's more than 200 times as much as the NRA gave to candidates’ campaigns during this period. This money appears to be linked to legislators’ positions on police accountability: legislators in either party who do not support police reform bills receive substantially more money from police unions and associations than those who support reform. 79 members of the California state legislature voted on bills in the 2015-2016 legislative session and then ran for re-election (or another state legislative office) in 2016. Their campaign finance reports show legislators in each party who did not support police reform bills generally received more money from police associations. Democratic legislators also received more money overall from police associations than Republicans did. This suggests police associations are strategically supporting Democrats who do not support police reform to prevent the Democratic majority from having enough votes to pass meaningful reforms. This strategy appears to be working: AB 1957 failed to pass the Assembly after nearly half of the chamber’s Democratic representatives did not support it; AB 36 failed after being vetoed by a Democratic Governor; and a 2016 bill to make police misconduct records public (SB 1286) died in the Democrat-controlled Senate Appropriations Committee after facing substantial opposition from police associations. After helping to elect most of California's legislators, police unions and associations spend considerable amounts of time and money to convince them not to support police reform bills. 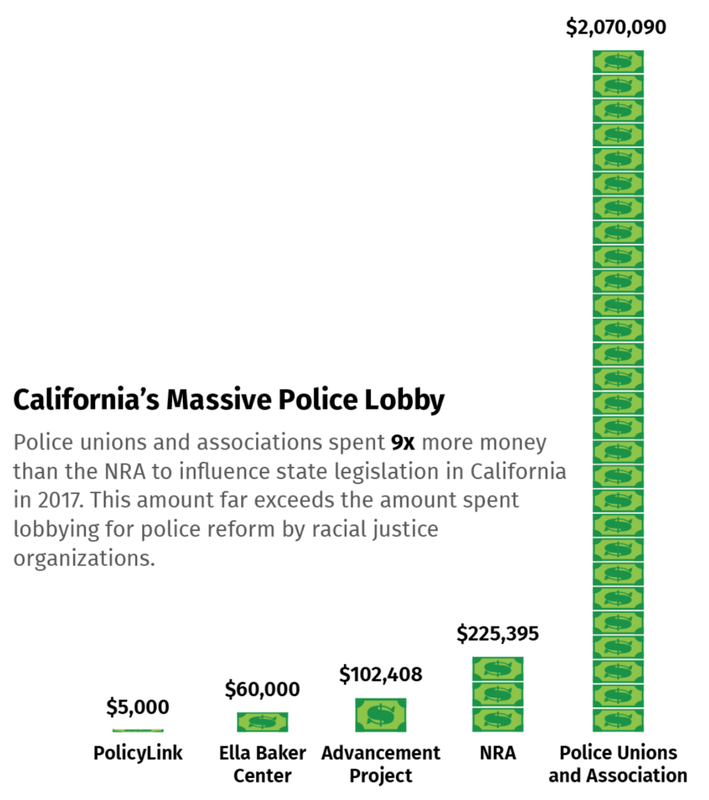 The state's database shows police unions and associations spent $2 million paying lobbyists to influence legislation in California in 2017 - nine times more than the NRA spent on lobbyists that year. This exceeds the amount of resources that racial justice organizations have to compete for the time and attention of the state legislature in advocating for police reform. And that's only police associations – District Attorneys associations and correctional officers’ unions also exert substantial influence on criminal justice policy within the state. From lobbying to campaign donations to police union contracts, it’s clear that police unions are a formidable barrier to putting in place the types of evidence-informed policies needed to address police violence. 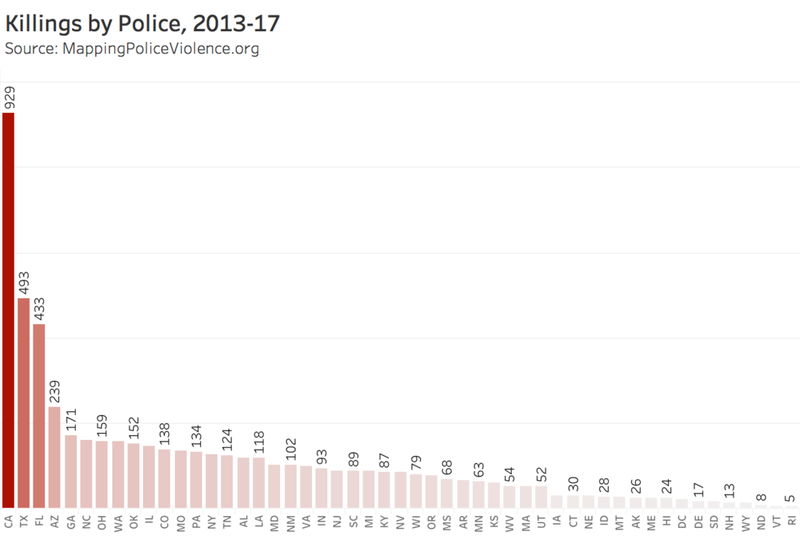 Given that police commit 1 in 11 gun homicides in California, their opposition to police reform also constitutes a significant barrier to reducing gun violence overall. Just as gun reform advocates have worked to pressure legislators to cut ties with the NRA, it will take a comparable effort in California to convince legislators to stand up to the Police Lobby, refuse to take their campaign contributions, and commit to supporting legislation that would make California’s communities safe from police violence. SB 1421, which would make records of police misconduct public. 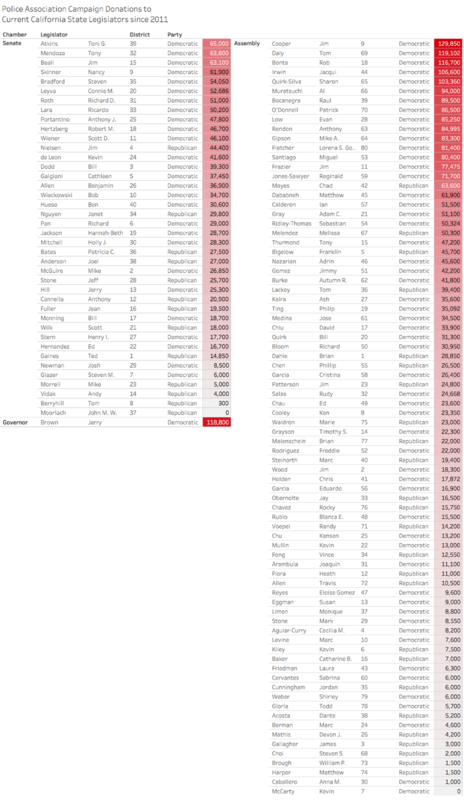 For reference, the table below lists the total amount California's 120 current state legislators have received in campaign donations from police associations since 2011. You can download the full database with detailed information about each donation as well as the calculations used for this analysis here. For inquiries contact sam@thisisthemovement.org.